Description: This tutorial is an introduction to FIWARE Draco - an alternative generic enabler which is used to persist context data into third-party databases using Apache NIFI creating a historical view of the context. The in the same manner asthe previous tutorial, activates the dummy IoT sensors persists measurements from those sensors into a database for further analysis. "Plots within plots, but all roads lead down the dragon’s gullet." FIWARE Draco is an alternative generic enabler which is able to persist historical context data to a series of databases. Like Cygnus - Draco is able subscribe to chnages of state from the Orion Context Broker and provide a funnel to process that data before persisting to a data sink. As mentioned previously, persisting historical context data is useful for big data analysis or discovering trends or removing outliers. Which tool you use to do this will depend on your needs, and unlike Cygnus Draco offers a graphical interface to set up and monitor the procedure. This application builds on the components and dummy IoT devices created in previous tutorials. It will make use of three FIWARE components - the Orion Context Broker, the IoT Agent for Ultralight 2.0 and introduce the Draco Generic Enabler for persisting context data to a database. Additional databases are now involved - both the Orion Context Broker and the IoT Agent rely on MongoDB technology to keep persistence of the information they hold, and we will be persisting our historical context data another database - either MySQL , PostgreSQL or MongoDB database. Potentially used as a data sink to hold historical context data. A webserver acting as set of dummy IoT devices using the Ultralight 2.0 protocol running over HTTP. The specific architecture of each section of the tutorial is discussed below. Where <command> will vary depending upon the databases we wish to activate. This command will also import seed data from the previous tutorials and provision the dummy IoT sensors on startup. Now go to the Components toolbar which is placed in the upper section of the NiFi GUI, find the template icon and drag and drop it inside the Draco user space. At this point, a popup should be displayed with a list of all the templates available. Please select the template MONGO-TUTORIAL. Select all the processors (press shift and click on every processor) and start them by clicking on the start button. Now, you can see that the status icon of each processor turned from red to green. Once Draco is running, you can check the status by making an HTTP request to the exposed draco port to /nifi-api/system-diagnostics. If the response is blank, this is usually because Draco is not running or is listening on another port. Troubleshooting: What if the response is blank ? You should see several containers running. If draco is not running, you can restart the containers as necessary. Once a dynamic context system is up and running, we need to inform Draco of changes in context. This is done by making a POST request to the /v2/subscription endpoint of the Orion Context Broker. 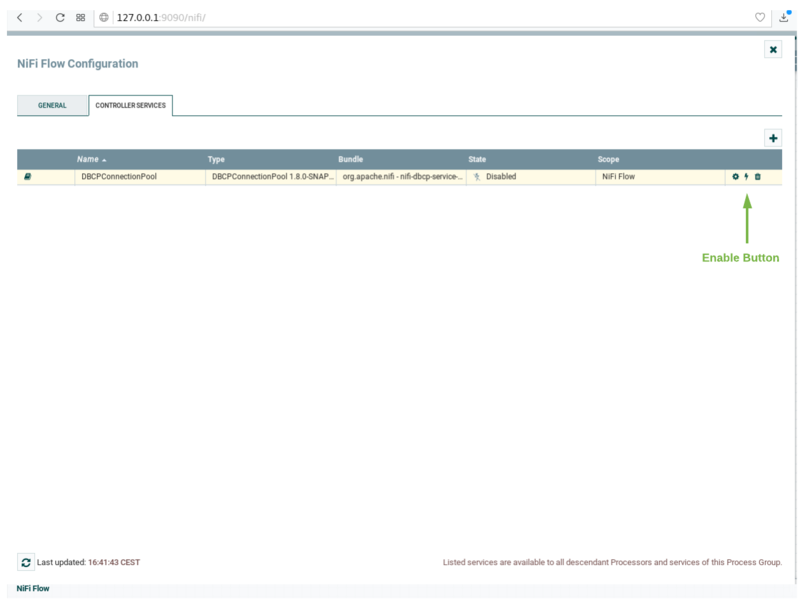 The idPattern in the request body ensures that Draco will be informed of all context data changes. The throttling value defines the rate that changes are sampled. If a subscription has been created, you can check to see if it is firing by making a GET request to the /v2/subscriptions endpoint. The lastSuccess should match the lastNotification date - if this is not the case then Draco is not receiving the subscription properly. Check that the hostname and port are correct. Finally, check that the status of the subscription is active - an expired subscription will not fire. 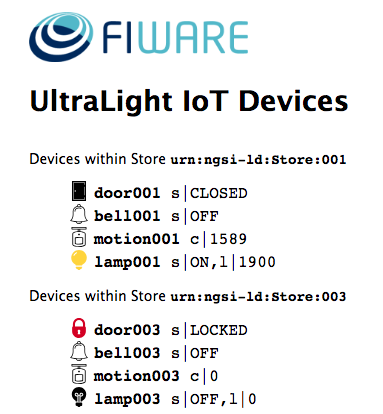 The Store entities were created without defining a fiware-service and therefore are held within the orion database, whereas the IoT device entities were created using the openiot fiware-service header and are held separately. The IoT Agent was initialized to hold the IoT sensor data in a separate MongoDB database called iotagentul. 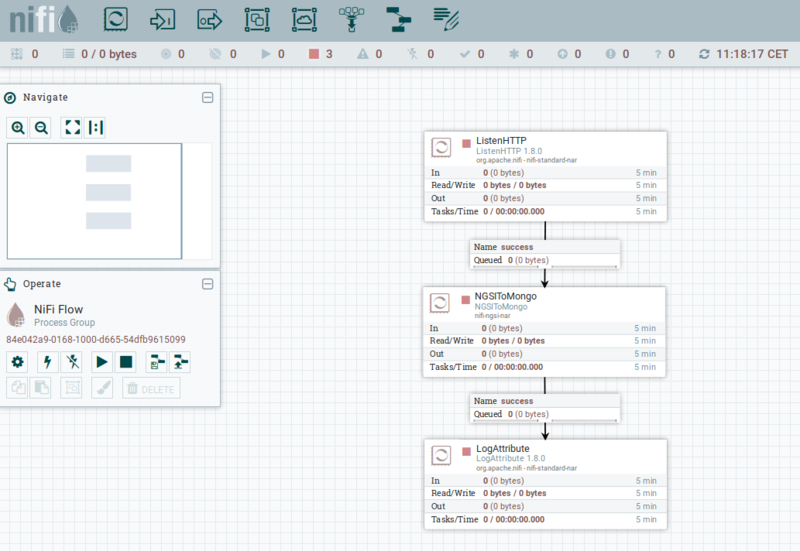 As a result of the subscription of Draco to Orion Context Broker, a new database has been created called sth_openiot. The default value for a Mongo DB database holding historic context consists of the sth_ prefix followed by the fiware-service header - therefore sth_openiot holds the historic context of the IoT devices. Looking within the sth_openiot you will see that a series of tables have been created. The names of each table consist of the sth_ prefix followed by the fiware-servicepath header followed by the entity ID. Two table are created for each entity - the .aggr table holds some aggregated data which will be accessed in a later tutorial. The raw data can be seen in the tables without the .aggr suffix. The historical data can be seen by looking at the data within each table, by default each row will contain the sampled value of a single attribute. 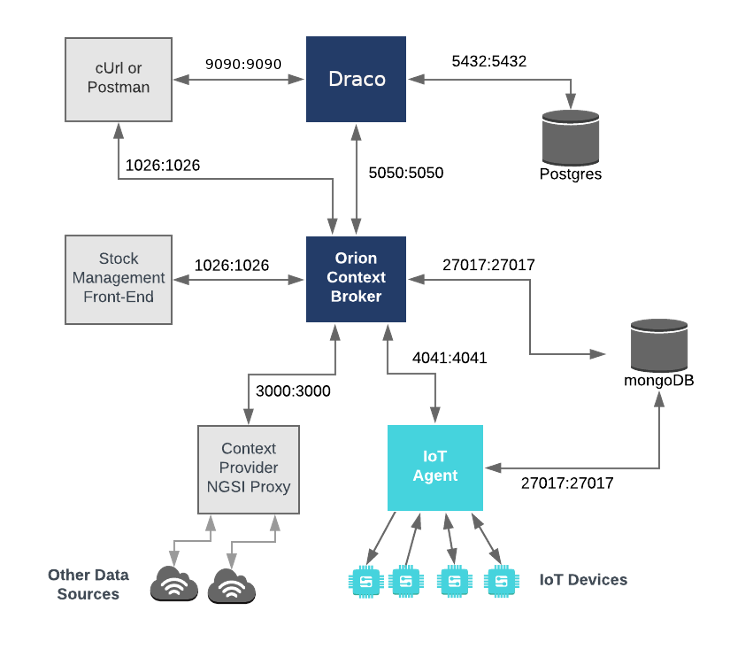 We now have a system with two databases, since the MongoDB container is still required to hold data related to the Orion Context Broker and the IoT Agent. The Web interface for Draco - 9090 is exposed purely for configuring the processors. Now go to the Components toolbar which is placed in the upper section of the NiFi GUI, find the template icon and drag and drop it inside the Draco user space. At this point, a popup should be displayed with a list of all the templates available. Please select the template POSTGRESQL-TUTORIAL. Do right click on any part of the Draco GUI user space, and then click on configure. 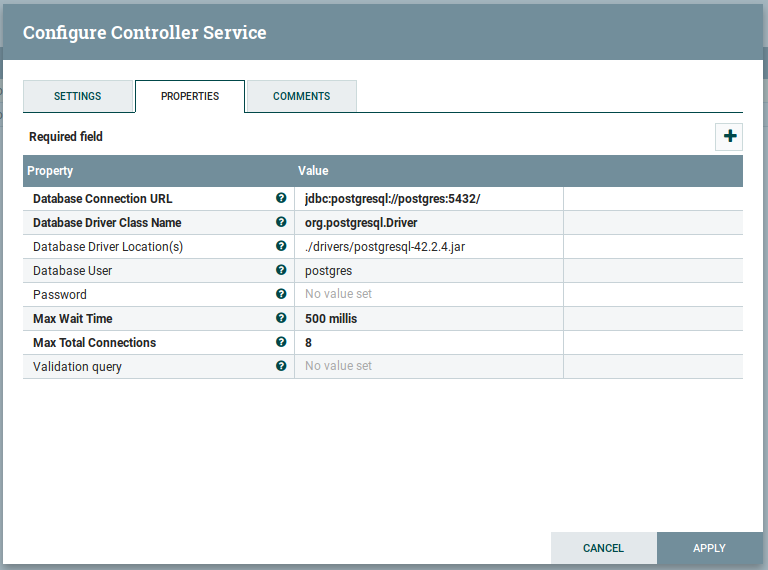 Go to the Controller Services Tab, at this point a list of controllers should be displayed, locate the DBCConnectionPool controller. 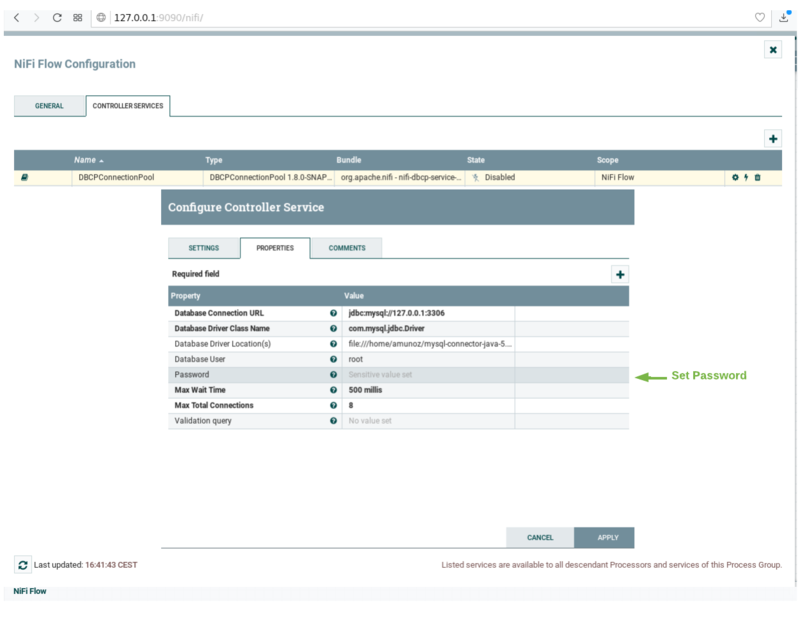 Click on the configuration button of the "DBCPConnectionPool"
Go to the controller Properties tab and put "password" in the password field, then apply the changes. Enable the processor by clicking on the thunder icon and then click on enable, then close the controller configuration page. 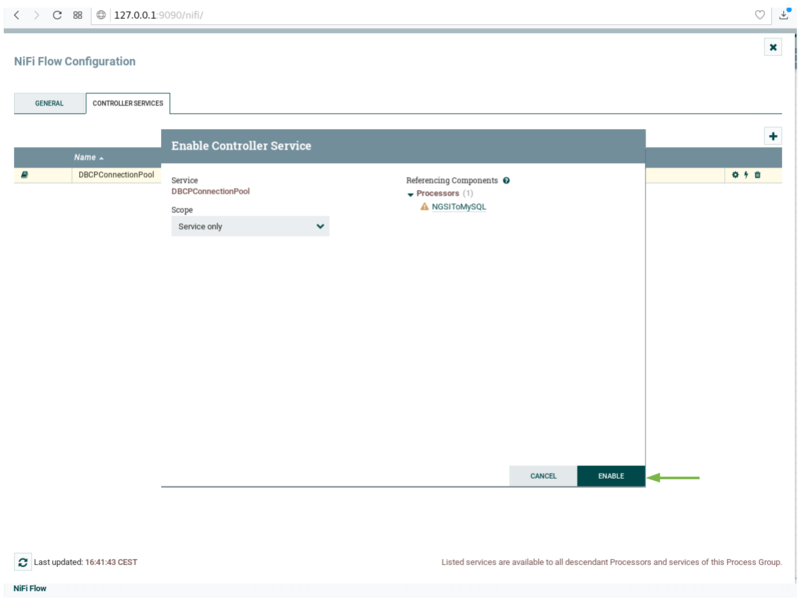 The result include two template databases template0 and template1 as well as the postgres database setup when the docker container was started. 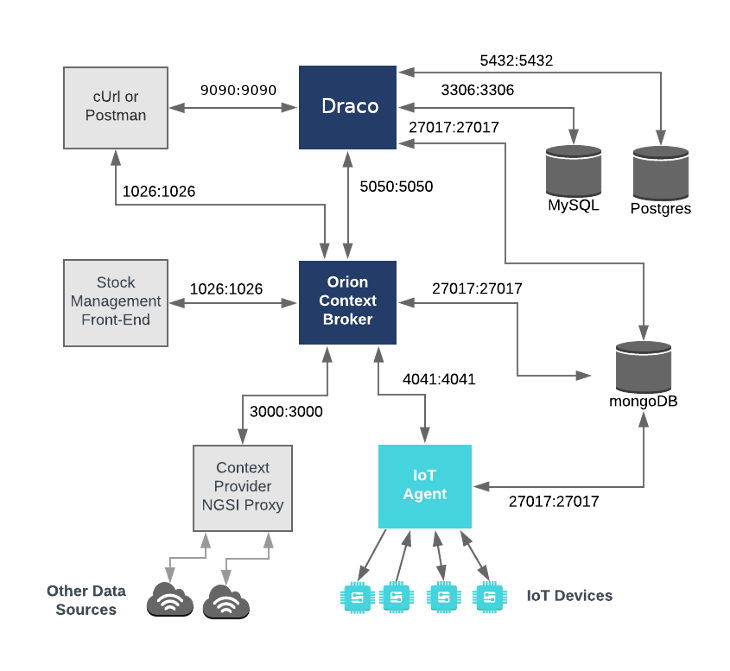 As a result of the subscription of Draco to Orion Context Broker, a new schema has been created called openiot. The name of the schema matches the fiware-service header - therefore openiot holds the historic context of the IoT devices. Once running a docker container within the network, it is possible to obtain information about the running database. 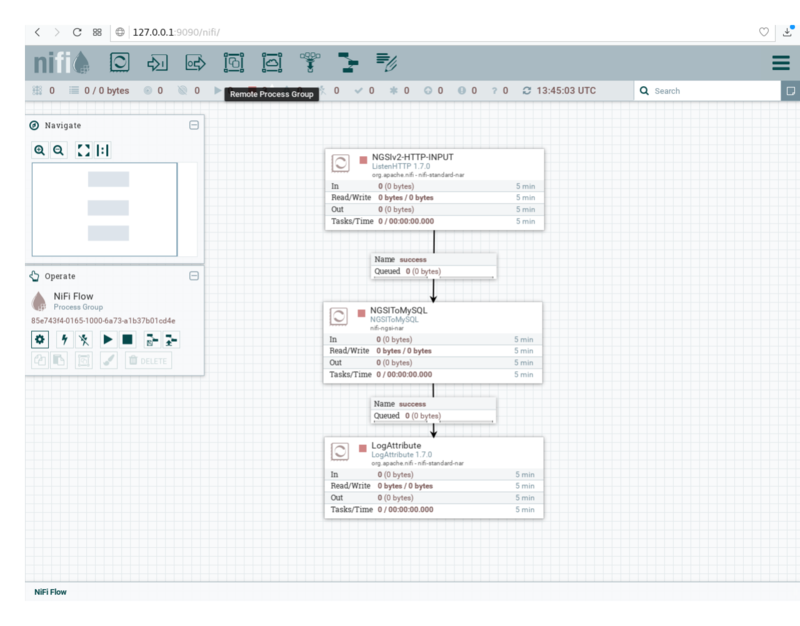 Once again we have a system with two databases, since the MongoDB container is still required to hold data related to the Orion Context Broker and the IoT Agent. MYSQL_ROOT_PASSWORD 123. specifies a password that is set for the MySQL root account. Now go to the Components toolbar which is placed in the upper section of the NiFi GUI, find the template icon and drag and drop it inside the Draco user space. At this point, a popup should be displayed with a list of all the templates available. Please select the template MYSQL-TUTORIAL. Go to the controller Properties tab and put "123" in the password field, then apply the changes. 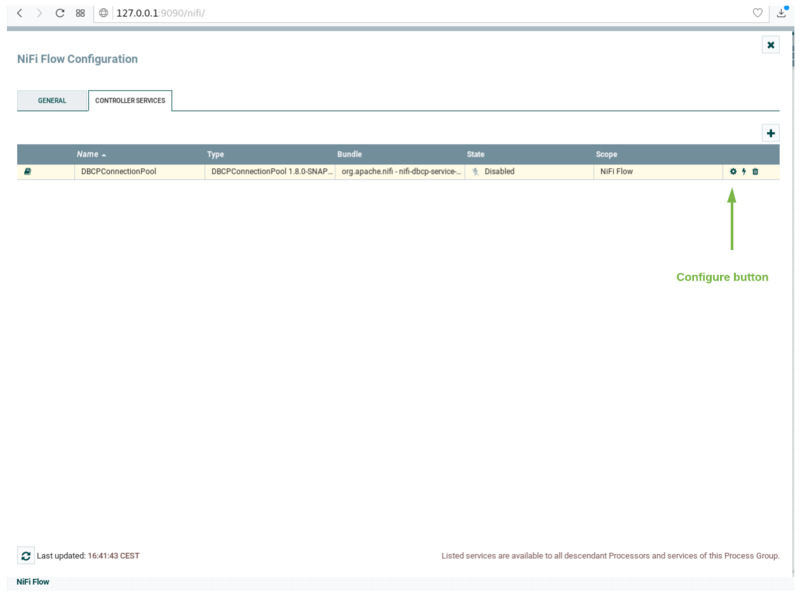 Once Draco is running, you can check the status by making an HTTP request to the exposed draco port to /system-diagnostics. If the response is blank, this is usually because Draco is not running or is listening on another port. 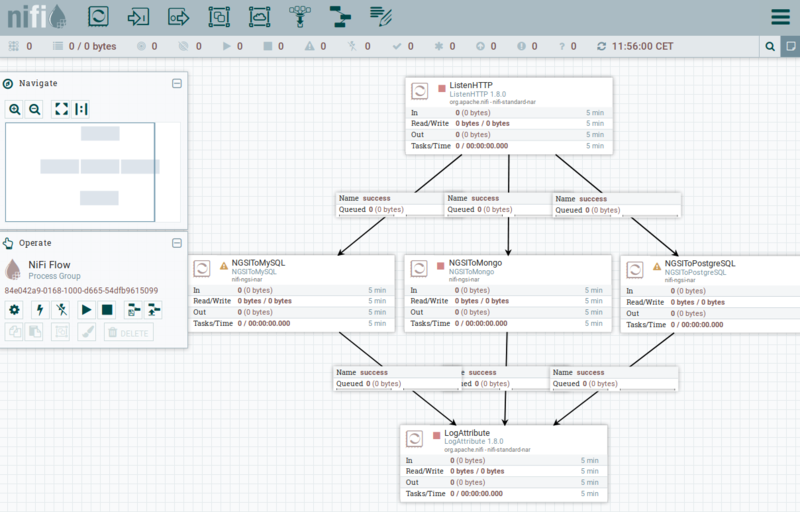 It is also possible to configure Draco to populate multiple databases simultaneously. 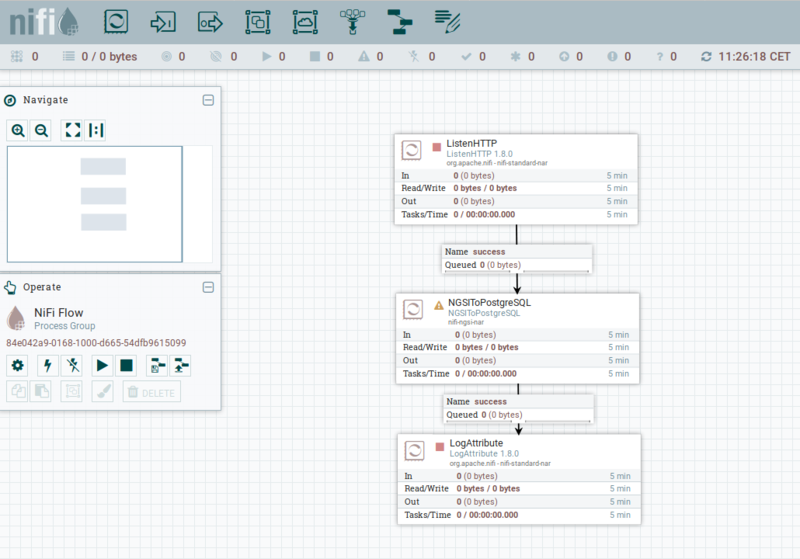 We can combine the architecture from the three previous examples and configure Draco to store data in multiple sinks. 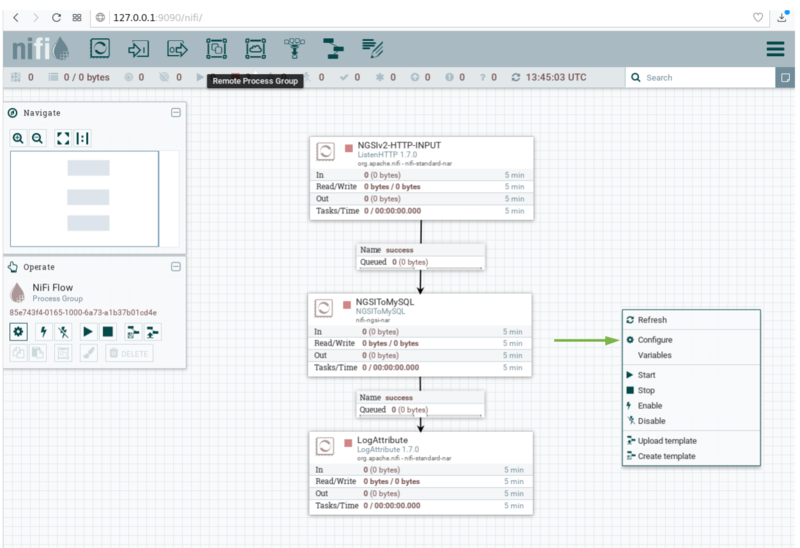 We now have a system with three databases, PostgreSQL and MySQL for data persistence and MongoDB for both data persistence and holding data related to the Orion Context Broker and the IoT Agent. Now go to the Components toolbar which is placed in the upper section of the NiFi GUI, find the template icon and drag and drop it inside the Draco user space. At this point, a popup should be displayed with a list of all the templates available. Please select the template MULTIPLE-SINKS-TUTORIAL. To read persisted data from the attached databases, please refer to the previous sections of this tutorial.